Thursday evening felt like Spring had finally arrived, lots of people in the streets and a generally lovely atmosphere. 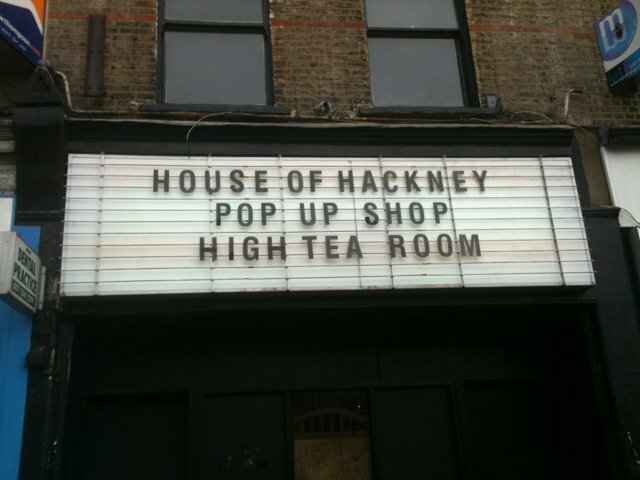 I had a really nice day too, after going to Milton Keynes for a meeting, It was late in the day so rather than going back to work, I met some colleagues and friends and headed over to Stoke Newington Rd for the House of Hackney Pop Up Store, really unusual and fabulous marketing idea, the East London interior design and homeward brand House of Hackney, had made over a vacant victorian home into a beautiful static display of furnishings and decor. No wonder the likes of Vogue editorial team, and Henry Holland graced its opening event. 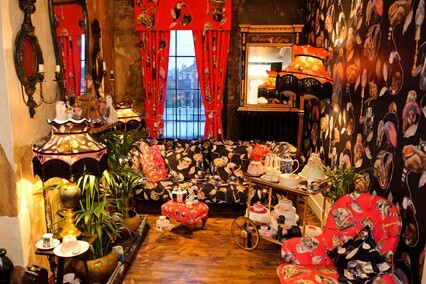 Downstairs in the basement floor was an eclectic victorian style tea room hosted by artisan baker Lilly Vanilly. The passionfruit fruit tar was scrumptious and the absynth ice-cream was unusually delicious. Pomegranate tea was also a treat. H O U S E O F H A C K N E Y reworks and subverts the concept of traditional British homewares product with playful and irreverent in house collections. Described as ‘Colfax and Fowler on acid’ House of Hackney breaks the traditional rules for interiors and fashion rules are applied instead. The inaugural collections Dalston Rose, Queen Bee and are inspired by Victorian Hackney in modern times.